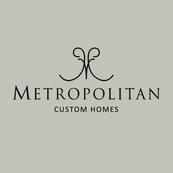 Metropolitan Custom Homes was a delight to work with. They were responsive to our communications, performed high quality work and were always ready to make changes or do what was necessary to get things "right." We also found their experience invaluable since this was our first time to build a custom home and there were many things that we did not know. One of Metropolitan's best qualities is their timeliness. They keep the process moving and we never felt like our house was being neglected or that work was not progressing. We also were impressed with the different trade crews that were used to work on the house, the head painter especially was particular that the job was done right. We would definitely build with Metropolitan again.